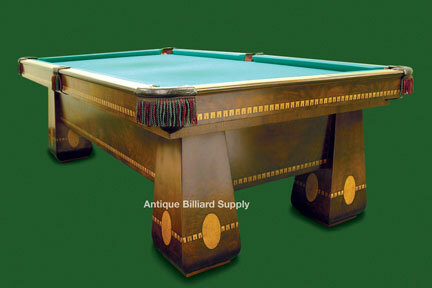 #01-17 Attractive Brunswick antique pool table of burl mahogany with extensive inlay of ebony, bird's eye maple and other exotic woods. Decorative accent pattern surrounds table at top and again on the lower portion of the cabinet and legs. Rail tops of Brazilian rosewood with mother-of-pearl sights. Nine-foot size, three-piece Vermont slate playing surface. Ready for delivery.